Fake News: A Roundtable Discussion from Quello Center on Vimeo. Since my last up-date, our Postdoctoral Researcher, Bianca C. Reisdorf, and Assistant Research Professor, Aleksandr Yankelevich, have come onboard. In collaboration with our Research Associates and Assistants, they have enabled us to move forward on new research proposals with some early success. Our plan to develop a natural experiment to assess the impact of net neutrality rulings has drawn a number of faculty together across the campus in shaping some preliminary research, and proposals which we hope to submit in the coming months. Two proposals have been accepted, and several others are submitted or underway to study digital divides and inequalities in Detroit, Michigan, and across the United States. The Quello Center is moving ahead in focusing greater attention on new Internet and digital age policy issues with an even more multi-disciplinary set of researchers and strong additions to our remarkable Advisory Board. We address issues that arise from: problems such as risks to privacy and freedom of expression; innovations such as around the Internet of Things and wearables; policies such as net neutrality, price cap regulation of access services, and universal broadband; and contexts, such as issues in cities like Detroit, and in households. To do so, we draw from theoretical perspectives, such as the Fifth Estate, sociological and communication perspectives on information inequalities, work on the ecology of games as well as game theoretical economics; and from innovative empirical approaches, such as a novel design for a national broadband availability dataset. Over this last year, the Center has found a number of local developments that present clear opportunities to pursue issues that are of nationwide and global concern. This has led us to anchor more of our research locally, such as in looking at digital divides in Michigan and Detroit, and in developing ideas for new research on the use of wireless spectrum for last mile access, and for experiments addressing digital inequalities and the future of public broadcasting. In these areas, we plan to work with the local public broadcasting station, WKAR, and faculty across the university. Together, we can realize the opportunities created by MSU choosing to forgo the FCC’s incentive auction of spectrum in favor of turning the station and its spectrum into an even greater resources for research, teaching, and service, such as through an MSU partnership announced with Detroit public broadcasting to create more educational programming. The Center organizes and promotes an active stream of roundtables, seminars, and lectures to stimulate discussion of policy and regulatory issues. Recent lectures and events have focused on Internet policy and regulation, network neutrality, social media and reputation management, digital inequalities, and social accountability. In addition to holding events at the Center and in Washington DC, we have been speaking at a variety of other universities, conferences, and events organized by others. For example, Quello helps support the Telecommunication Policy Research Conference (TPRC), and the director has spoken recently in Canada, Argentina, Denmark, South Africa, Hong Kong, China, Japan, and Mexico. A list of past and forthcoming events are available at: http://quello.msu.edu/events/ and videos of many of our events are available on Vimeo at: https://vimeo.com/quellocenter. Dutton, W.H. and Graham, M. (2014), Society and the Internet (Oxford University Press). Reisdorf, B. C., & Groselj, D. (2015). ‘Internet (non-) Use Types and Motivational Access: Implications for Digital Inequalities Research,’ New Media & Society, Online First. Reisdorf, B. C., & Jewkes, Y. (2016). ‘(B)Locked Sites: Cases of Internet Use in Three British Prisons,’ Information, Communication & Society, 1-16. UNESCO (2015), Keystones to Foster Inclusive Knowledge Societies. Paris: UNESCO. The English version is available at: http://unesdoc.unesco.org/images/0023/002325/232563E.pdf. Yankelevich, A., & Vaughan, B. `Price-Match Announcements in a Consumer Search Duopoly.’ Forthcoming at Southern Economic Journal. Thank you again, and please keep in touch. Follow the work and ideas of the Quello Center on Twitter or Facebook, and write to the Center at Quello@msu.edu if you have any questions, suggestions, or wish to be added to our email list. Alexander Heffner delivered an engaging Quello Center Lecture on the engagement of ‘millennials’ in public media, issues and discourse. You are welcome to view the lecture, delivered on 18 March 2015, by going to the video below. 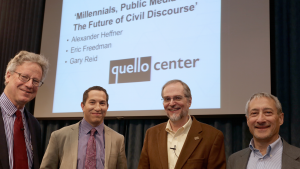 Quello Lecture and Panel on ‘Millennials, Public Media and The Future of Civil Discourse’ by Alexander Heffner (NEW) from Quello Center on Vimeo. Alexander is seeking, through his work on ‘Open Minds’, a way to foster a more ‘civic-minded journalism culture, non-adversarial broadcasting in the public interest, and critical exploration of prosocial ideas.’ His talk can be viewed here, along with responses from two colleagues at MSU follow his talk, Eric Freedman, a Pulitzer Prize winning journalist at MSU, and Gary Reid, the Director of WKAR in East Lansing, Michigan. The responses and discussion challenge the concept of ‘millennials’, what is ‘newsworthy’ v ‘viral’ and what the key issues are in the future of public discourse – changing audiences, business models, the role of the journalist, and the quality of discourse. Optimists and pessimists about the future of public discourse can be found in the discussion. Alexander is a graduate of Andover and Harvard, is host of The Open Mind on PBS Channel THIRTEEN/WNET and CUNY TV. Eric Freedman is the Knight Chair in environmental journalism and director of Capital News Service at MSU’s School of Journalism. Before joining the faculty full-time in 1996, Freedman was a reporter. 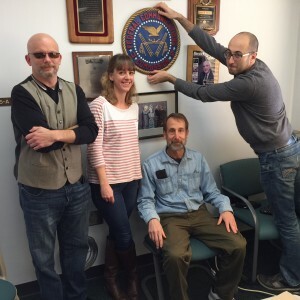 Gary Reid is the Director of Broadcasting and General Manager of WDBM-FM, WKAR-AM/FM/TV. He is a University Distinguished Senior Specialist in the Department of Media and Information at MSU and an Associate Director of the Quello Center. Alexander’s lecture is about 25 minutes, including my introduction, with two short responses, and discussion. We’d welcome any comments or feedback on this talk here on the Quello Center blog. Alexander Heffner on the Future of Quality Broadcast News Media: Optimism or Pessimism? The College of Communication Arts & Sciences enjoyed a visit by Alexander Heffner, yesterday. Alexander is the host of Open Mind, a pioneering program for public broadcasting which his grandfather launched in 1956. Today, in the digital age, Alexander has relaunched Open Mind, and is speaking at universities across the country about his efforts, and the issues he holds dear around the role of public media in the future of public discourse, news and public affairs. Yesterday, Alex spoke on ‘Millennials, Public Media and The Future of Civil Discourse’, with responses from one of MSU’s Pulitzer Prize winning journalists, Eric Freedman, and one of Quello’s Associate Directors, Gary Reid, director of MSU’s public radio and television station, WKAR. Prior to his lecture, Alex met with Bonnie Bucqueroux’s freshman class JRN 108, with over 100 students interested in the media and society, and then had a box lunch in the Quello Meeting Room with a dozen journalism students interested in broadcasting careers. His lecture and the discussion will be online soon, but in the class, and in the following lecture, I was struck by the basic conversation between optimistic and pessimistic portrayals of millenials, civility in public discourse, and interest in high-quality news and information. Alexander is basically optimistic, or he would not be pursuing his vision. The students seemed generally more optimistic than I expected about the role of social media, for example, as a platform for following the news, but many others during the day saw click rates and celebrity fandom undermining interest and readership of quality news and public affairs. Some journalists argued that nothing has changed with the primary focus remaining on good stories and conflict, but others saw popular news programming creating a culture of conflict and point-counterpoint superficiality versus serious efforts to convey the complexity of public issues. At the most general level, Alexander’s visit highlighted the issues of funding and producing quality journalism in the digital age of online news and social media. There are many worries that the Internet and new media and new audience practices will undermine the business model of quality journalism, and Alexander seems to be attacking this head-on and making a strong, creative entrepreneurial effort to maintain and enhance an existing stream of work, often using the Internet to support him, such as in building on the archive of brilliant interviews begun by his grandfather. Today he is speaking with students in our College of Education, but he has left us talking about what we can do to foster informed and civil discourse in the digital age of social media. I am certain that the Open Mind is one programming effort that will help foster a more civil and informed public discourse.